Ms. Nasser's Art Studio: 2019 Flint Public Library Art Exhibit: Our BIGGEST Yet! 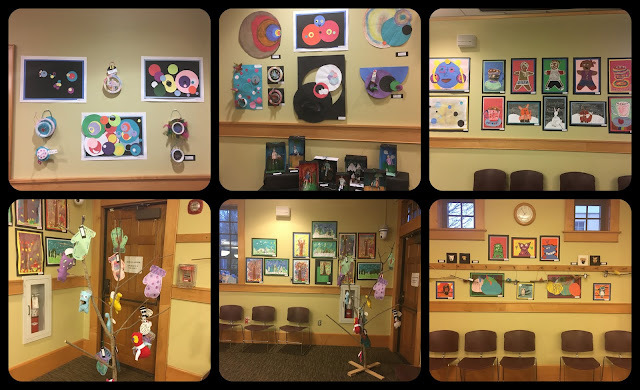 2019 Flint Public Library Art Exhibit: Our BIGGEST Yet! in our school to hosting one in the community at the Flint Library. I love that the greater Middleton community gets to see our student's amazing art work. The hardest part of this was only having a smaller select group of students on display. We make a conscious effort to have as many different students as we can from previous years. This year's show did not disappoint! It was our biggest yet with 229 pieces of student artwork on display. That is almost 100 MORE pieces than we had last year. and displayed on the walls of the community room at the library. I love grouping Kindergarten artwork next to 5th and 6th grade work with similar colors or styles. We had an incredible turn out at our opening reception for the 2019 art show. I was blown away by the number of proud artists and families who came! If you didn't get to see your child's work last week, There's still time! The exhibit will be up at the library for the whole month. Please note, that some of the 3D works have been moved to the children's room for safe viewing.